The Cumberland & Dumfriesshire Farmers’ Mart P.L.C. 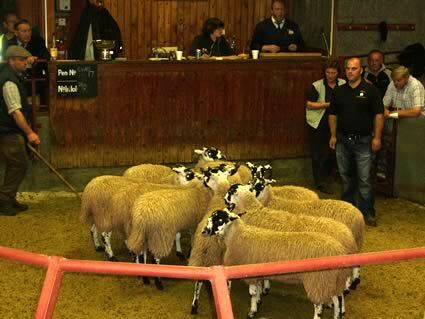 had forward 6,550 Annual Sale of Greyface Mule and Other Breed Ewe Lambs, at Longtown on Tuesday 15th September 2009. The champion pen of Greyface ewe lambs from Midtodhills. 1st prize – Messrs Carruthers, Peela Hill, Bewcastle. 2nd prize – Messrs Walton, Allensgreen, Bardon Mill, Hexham. 3rd prize – Messrs Walton, Wanwood Hill (ex Cowden), Alston. 1st prize – Messrs James, Midtodhills, Roadhead. 2nd prize – Philip Roddam, Fordlands, Hethersgill. 3rd prize – Messrs Wallace, Gapshield, Gilsland. Champion Pen – Messrs James, Midtodhills, Roadhead. A very good quality of Mules attracted buyers from as far as Northampton, Devon and Cornwall, bidding was very fast with averages up £31.28 on the year, with an overall average of £69.37. Great credit must be given to vendors for presenting lambs to perfection. Top of £102 for pens of Mules from Messrs James, Midtodhills, Roadhead and Messrs Carruthers, Peela Hill, Bewcastle, other pens to £100 Allensgreen and Fordlands, £92 Wanwood Hill, £90 Gapshield, Old Police House and Blacksmiths Cottage. Top flock averages of £91.54 Allensgreen, £86.12 Fordlands, £83.75 Wanwood Hill. Others breeds saw quality very easy to sell. Top of £87 for Charollais from Barkbeth; Beltex £80 Waterside and Middle Farm; Texel £75 Whitchesters; Suffolk cross £68 West End, £66 High House; Cheviot Mule £66 Springwell.